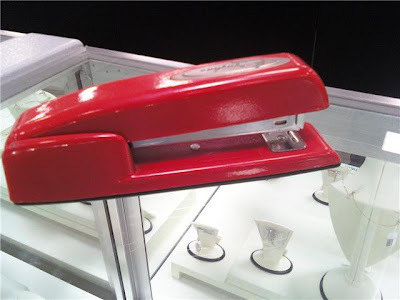 everydaymatters: "My Red Swingline Stapler"
"but then, they switched from the Swingline to the Boston stapler, but I kept my Swingline stapler because it didn't bind up as much, and I kept the staples for the Swingline stapler"
I was talking to my mom at work a while ago, and saw that this is her stapler. She totally didn't get it either because she's never seen the movie. If you haven't seen it I'm not going to explain it, because you need to watch the movie. It is hilarious. It's even funnier if you've worked in an office, because you have worked with those kind of people.